Ideal for travel, the 2-in-1 Magnetic Art Desk is a portable desk that fits comfortably on your child's lap. Slide open magnetic 2-sided drawing board can be used flat or in the upright position. Magnetic letters and dry erase pens store inside. This playful activity rug makes for game time anytime! 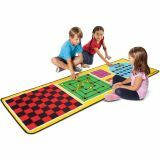 The design incorporates four classic board games—Tic-Tac-Toe, Checkers, Nine Men's Morris and Solitaire—so there are lots of ways for kids to learn and play. 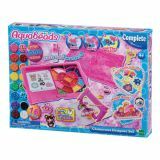 Includes 36 double-sided wooden play pieces in a mesh bag and detailed game instructions. 78" x 26", machine washable. 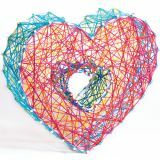 From Melissa & Doug for ages 3+. Miniature wooden version of an accordion really works! 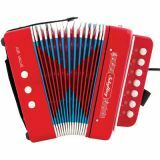 Features real air valves, bellows, bass and harmonic notes and hand straps. Comes with a cool instructional booklet and song book. 7"H. Ages 7+. By Schylling. 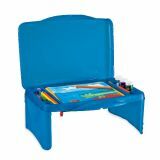 Portable practical lap desk is great for kids on the go. 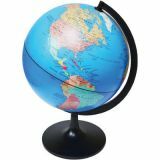 It has a large writing surface that doubles as a storage compartment. These sturdy cardboard building blocks are lightweight yet strong, and assemble in just minutes. Each brightly-colored block can be stacked high to make endless building combinations. 10 pieces. Ages 2 and up. 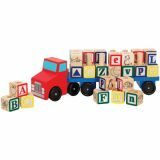 A cargo of 28 wooden alphabet blocks stows on the sturdy trailer of this wooden truck toy. 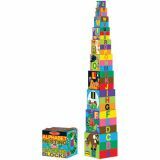 Practice your alphabet, words or just building with blocks featuring upper and lowercase letters. It's a fun combination of classic toys. Ages 2+. With over 1,000 Jewel Beads, Solid Beads and new silver beads, creating accessories is more fun than ever! This set includes pieces to make flat designs, a key chain, 3D rings, and even a wearable tiara! Bead case has a beautifully designed lid to look like a glamorous jewelry box. 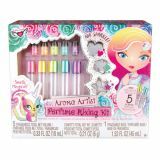 Perfume mixing kit includes 8 fragrances, 5 roller bottles, 3 shapes of confetti, sticker sheet, fragrance base, and instructions. Provide the imaginative spark to launch high adventures. 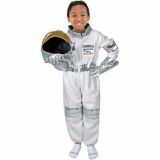 Astronaut jump suit and accessories gets kids ready to soar. Fits ages 3-6.